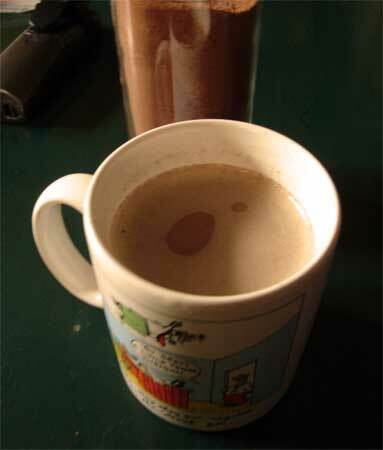 My version of a mocha: coffee with 3 scoops of hot chocolate mix. We interrupt the tutorial on making handwarmers to bring you a recipe for hot chocolate mix. It was a must today. Snow, yes S-N-O-W fell on us today at the busstop. Not just flakes either, actual snowballs. It’s still 2 days ’til Halloween! While this isn’t unheard of here in eastern Pennsylvania, we like to keep our snowfalls around the holidays and into the New Year. We were surprised, to say the least. So in honor of the snow I needed hot chocolate and low and behold we had none. So I whipped up 2 more batched of hot chocolate mix. This recipe is based on Tyler Florcence’s hot cocoa and homemade marshmallow recipe. The flaws with his recipe are 1) My kids think the cinnamon makes the hot chocolate “taste funny.” That really is for the adult palate. 2) Four ounces of chopped bittersweet chocolate. Really. If there’s 4 ounces of bittersweet chocolate in bar form in my house, it’s likely in my mouth. I use chocolate chips, which end up half melted on the bottom of the cup. Bonus! At the end of the drink you eat them with a spoon. Stir all ingredients together in a big bowl. Store in an airtight container. To make the hot chocolate: heat 1 cup of milk (always use milk unless the cow ain’t givin’, then water is okay) and stir in 3 to 4 heaping teaspoons of mix. *Vanilla sugar is plain white sugar that’s been sitting in an airtight dish with vanilla beans. It gives the sugar a nice vanilla note. The hot chocolate mix makes a nice gift around the holidays. This winter I intend to try Tyler’s marshmallow recipe, too.